Norway has lots of great cakes – but we think that Verden’s Bedste really is one of the best ones. Perfect for Norway Day on 17th May. Calling something the ‘world’s best cake’ is quite a statement, but not something taken lightly by the Norwegians. This cake contains the most delicious whipped cream, sponge, pastry cream and meringue – it’s everything you could ever want wrapped up together in one bite. 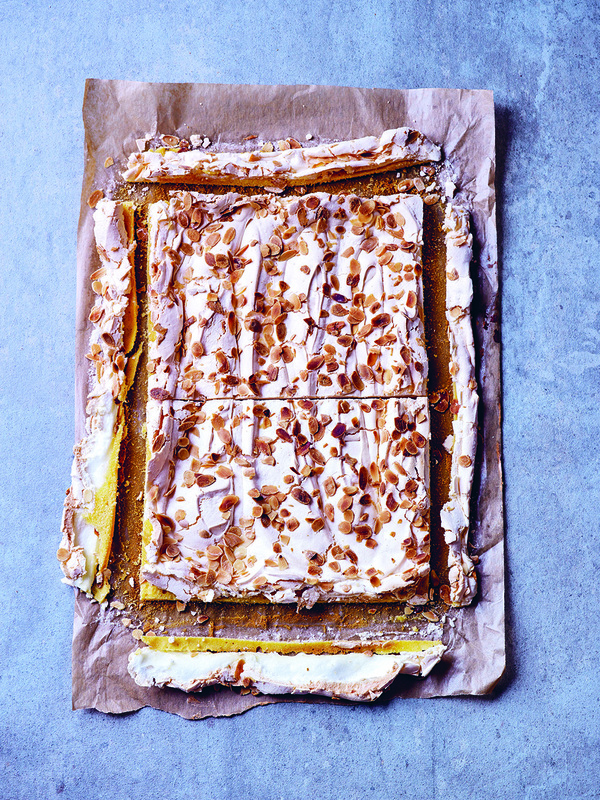 This cake is so seriously good that it is often labelled the national cake of Norway. It is also known as Kvæfjord cake. Kvæfjord is a municipality in Tromsø in northern Norway, an absolutely stunning place with picture-perfect rolling green hills, rocky fells and deep blue fjords . To eat this cake in that setting: it doesn’t get better than that, at least not in our mind. 1/2 portion of Pastry Cream you can use ‘Kagecreme’ – powder stirred with milk – ready in 5 mins – or make your own. Preheat the oven to 160°C (325°F) Gas 3. In a stand mixer (or using a hand-held electric whisk) cream together the butter and sugar until pale and light. Add the egg yolks one at a time, beating to ensure everything is well incorporated. Sift in the plain or cake flour, baking powder and vanilla and fold in. Lastly, add the whole milk and fold again until fully combined. Spoon the mixture into the prepared pan and spread out evenly and set aside aside for a moment. Next make the meringue topping. Using a completely clean bowl, whisk the egg whites with the cream of tartar until soft peaks form. Add the sugar very slowly, bit by bit, beating on high speed until stiff peaks form (about 5 minutes). Spread the meringue mixture on top of the cake mixture. Scatter the flaked almonds on top. Bake in the preheated oven for 35–40 minutes or until a skewer inserted into the middle comes out clean and the meringue is firm. Leave to cool for a few minutes in the pan then turn out carefully, so the meringue is still on top. Leave to cool completely. Whip the cream until stiff and fold together with the pastry cream. To assemble, cut the cake into two halves. On one half, spread the pastry cream mixture, then carefully layer the other half on top. Leave to set in the refrigerator for an hour before serving. The meringue will stay mallowy and the base soft. Recipe taken from ScandiKitchen: Fika & Hygge by Bronte Aurell (Ryland Peters & Small, £16.99) Photography by the amazing Peter Cassidy.